I've just been reading the section in WGJ #2 'Optional Rules For Non-Proficient Checks', which I noticed doesn't mention the (admittedly also optional) discipline 'Jack of all trades'. Since this requires a D12 roll, rather than a D10 or a D20, how would you make this work with the suggestions? Warden's suggestion, if taken on a 12 only, would give the JOT a *smaller* chance at higher difficulty levels! Allowing Warden's option on a 10+ on a d12 gives the right kind of curve, although it feels a bit clunky. I liked the idea of Jimmy's approach in that it kept to a D20, but it already uses all the simple ways of rolling d20s I can think of! The only option I can think of with this approach would be to not allow JOT. First off, welcome to the forums, JimLeCat! Second, that's an awesome and unexpected question. I haven't encountered it, and it hadn't yet occurred to me. If you are using my d20 optional non-proficient checks, my first take (and I haven't slept on it), is to make a JOT roll 3d20 and average the lowest two rolls. There's just a tad of crunch to it, but I think the essence of JOT is preserved. I am going to look at the math. Awesome problem. I'll get back to you. We have been rolling 2d20 and taking the worst result for for the non proficient skill rolls. It seems to be working well. Dont know how it fits in statistically but it works. That's an interesting thought for JOT. Without actually doing the maths, averaging two rolls is going to give you an s-curve, which would give you better odds of success at low difficulty levels than the basic D20 roll, but dropping off sharply at mid-level difficulties and having a much lower chance once the difficulty level gets into the teens. 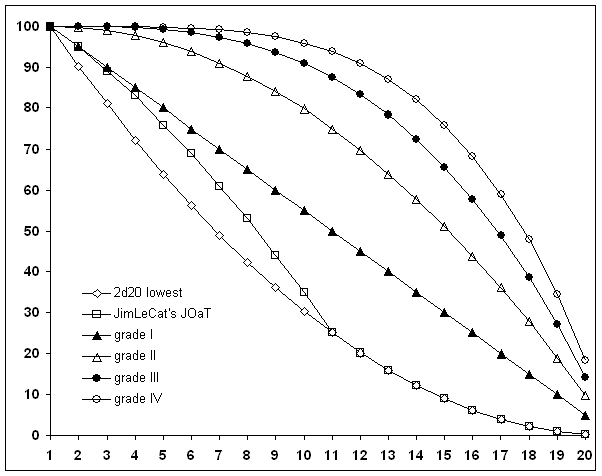 Making it the average of the two lowest out of three would bend the curve down towards the lowest-out-of-two curve. The only questions then are, does it give a better chance than level-1 proficiency at the bottom end (probably not even without the maths 'cos lowest difficulty used is 5), and does it give a worse probability than the basic unskilled roll at high difficulties? I don't have the time to check right now, but it does feel like you are right and this would work! It seems like it does. I made a set of practice rolls in excel and it appeared to fall right. I'm going to work on getting the probability curve. I'd like to add this to WGJ3. I'll share the curve when I get it. * not actually zero, of course, but might as well be! Does this match your results? If so, there are a couple of problems - this gives a marginally higher chance of success against a target of 5 than a grade 1 proficiency (83% vs. 80%) and, more importantly, it gives lower chances of success against target numbers of 13 and higher than the lowest of 2d20! After posting last night, I slept on the problem and came up with (I think) an answer. If you roll 2d20, then if either of them is above 10, you take the lowest, otherwise you take the highest. This is less than the chances when rolling a single D20, so that problem goes away. It also gives better chances than the 'lowest of 2D20' for target numbers 11 or less, but matches that option for target numbers above that. Tweaking it by varying the threshold number adjusts the height and width of the lower bulge in the odds quite nicely. Jim, I think you are right. I haven't crunched out my suggestion, but a string of excel practice rolls suggest the same. Actually, averaging the lowest 2d20 does have a 'pull-up' on the low end that beats out a straight d20. Not only does it fit, but it is a nice tweak to the dice the character would be rolling anyway. I'm going to think a bit more on it, but I think you've got a nice JOaT solution here. Nice graph! What did you use to draw it? Excel. It's a love/hate thing. I dig your solution, BTW. Definitely going in WGJ3. Graphs and numbers make my eyes cross, and then the left side of my body goes numb while the other half convulses and froth flies from my mouth, finishing with complete loss of bowel control (but in reverse). What I'm completely failing to say is that I'm really freaking impressed with what you guys have done here. I know what you mean. I lean more to the hate having coded to the automation interface! I use OpenOffice at home. I worked out a set of sheets for the simpler cases here, but resorted to c# for the more complex options. I understand Jimmy's a physicist, I'm an ex-engineer turned computer programmer. It's just what happens when science geeks get together! In any case, browsing the list archives, I seem to recall your name next to a lot of interesting stuff.